Storm clouds form over the Daintree River. (G. Thomas Bancroft) Click on the picture to see a larger version. Saltwater crocodile: what goes through your mind when you hear these words spoken: Maybe man-eater, vicious, cold-blooded killer, scary reptile, tropical Australia, or maybe Crocodile Dundee movies? For me, I think magnificent crocodilian, prehistoric predator, an animal from the time of dinosaurs, and oh, do I want to see one in the wild. As I planned my trip to Australia, I began to look into options that might allow me to see one. I wanted to go to Carnes in northern Queensland to see tropical birds and I discovered that some people did guided trips along the Daintree River, which is only 110 km north of Carnes. Maybe an excursion there would find one? Wild Watch Australia offered an early morning trip up the Daintree River followed by a full day of birding in the Daintree and Carnes Area. I contacted Jonathan Munroe, the owner of Wild Watch Australia to see about possibilities. I ended up booking a 4-day tour with him in which the last day would be in the Daintree River Valley. We arrived in Daintree Village just as the sun was about to go down. I checked into Daintree River Lodge, which sits on a bluff above the River. I could look down on the River from the deck in front of my room. The deck sat about 15 meters (45 feet) above the river. Jonathan told me that last year during the rainy season, the river rose to within a dozen centimeters of the deck. I stood in awe, sweat running down my face in the 90° F temperature, staring down at the river trying to imagine what it might look like if the water was almost lapping at my feet. I guess when it rains it sometimes really rains. The River drains a watershed of over 2,000 square kilometers and is part of the wet tropics of Australia. More than 2 meters of rain occurs here each year and it often comes as a torrential downpour, which can cause the river to flood. Thick lush vegetation grew right up to the edge of the deck. I could hear frogs chirping and insects squeaking in the bushes to my left and honeyeaters still buzzed around in the tops of trees near the river. Fine leaf palms along with banana palms pushed through the vines and bushes on the steep slope. Rain clouds covered the setting sun and I wondered if we might have rain tonight. 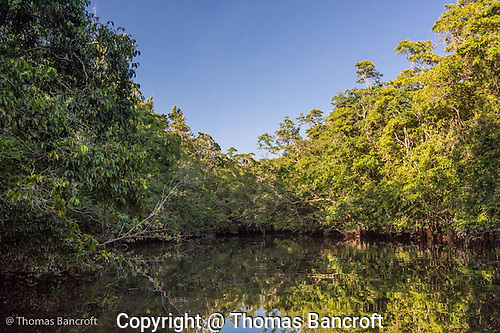 The mouth of Barratt Creek along the Daintree River. (G. Thomas Bancroft) Click on the picture to see a larger version. We met William at 6AM by the dock below the lodge. He is a thin tall Aussie about my age with a thick accent and his small boat sat low to the water. I wondered how easily a crocodile might come up over the side and into the boat. I had read reports of crocodiles lunging out of the water, grabbing an unsuspecting fisherman and pulling him to his death. At least the boat has nice swivel seats. The tide was out so William had pulled the boat up to the edge of the sand for us to board. A young couple from Brisbane joined us for the cruise; they too were out to see birds along the river. I asked William what our chances were of seeing a crocodile this morning. He said they had not seen any on cruises during the last week. With the warm weather, the crocodiles don’t need to bask in the sun and tend to stay hidden. The crocodile’s yellow eye with its black pupil stares right at us, just a few meters away. (G. Thomas Bancroft) Click on the picture to see a larger version. We cruised first up the river, passing Steward Creek looking for birds before we headed down the river. About a mile down river from the boat landing, we came to Barratt Creek along the southern shore and turned to enter. The creek mouth, a dozen meters across gave us a nice entrance into it. Mangroves lined both sides and we started slowly up the creek. Jonathan and William spotted a crocodile simultaneously. He was lying close to mangroves roots and under several overhanging branches. Jonathan thought it might be 5 meters long. I said, “no way, maybe 3 meters at most.” William cut the motor and we drifted up the creek toward the croc. As it slipped along the edge of the mangroves, we realized it was much bigger than I first thought, at least 4 meters long, a very impressive beast. 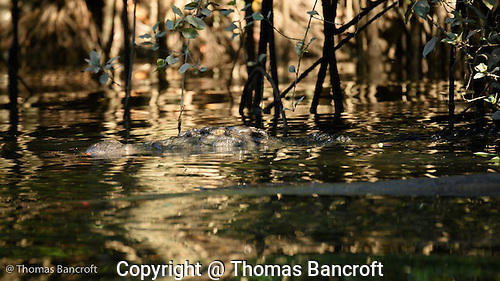 A 4-meter estuarine crocodile glides out of the mangroves as we pass in a small boat. (G. Thomas Bancroft) Click on the picture to see a larger version. I watched it through my binoculars as it glided in and out of the sun. Its yellow eye with its thin, vertical, black pupil looked straight at us and gave me the shivers even though it was already in the 80s. Several bone-like knobs made a ridge in front of the eye and a large bone crest extended behind its eye. More knots dotted the area behind its neck and its back and tail had large bone plates. Slight sinuous movements of its tail propelled it slowly through the water. After 5 minutes, the crocodile slowly sank out of sight into the water column. I wondered where it might pop back up; would it come up right beside us. I did not lean over the side to look for it under water. No, it was gone and we continued up the creek looking for other wildlife, birds, and plants. My blood flowed rapidly through my body; I felt flushed and breathed more rapidly than maybe I should. The thrill ran through me. I had seen a truly magnificent prehistoric animal and a big one at that. Mangroves line Barratt Creek. (G. Thomas Bancroft) Click on the picture to see a larger version.